After a few years of trying and failing, we finally had a good harvest of basil this year. I don’t know what we did differently to deserve it this year but we are thankful! I love brushing by it in the garden and getting a whiff of that sweet smell. And of course we both love eating it. The first year that we had basil (and only, I think), we tried drying it. It ended up brown and unusable and a complete disappointment. The parsley dried the same way. The next year we got wise and froze it instead. 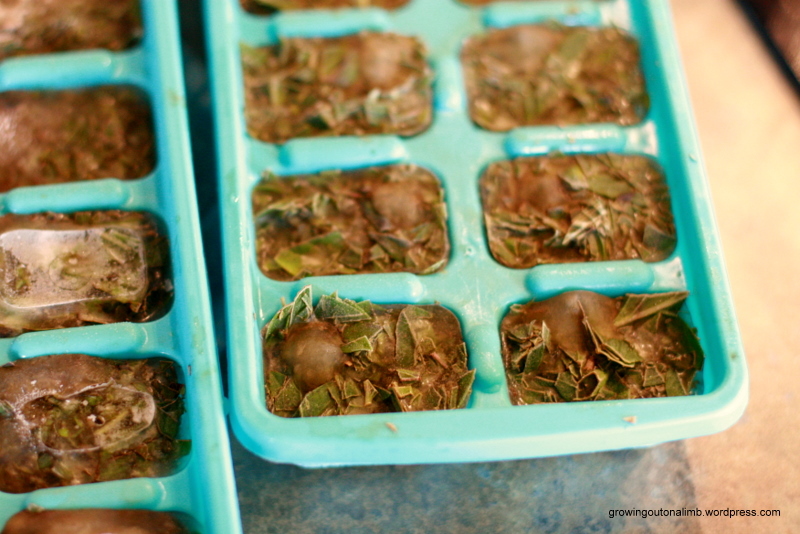 The best way, we found, was to clean it, chop it up, and then put a tablespoon in each well of an ice cube tray. 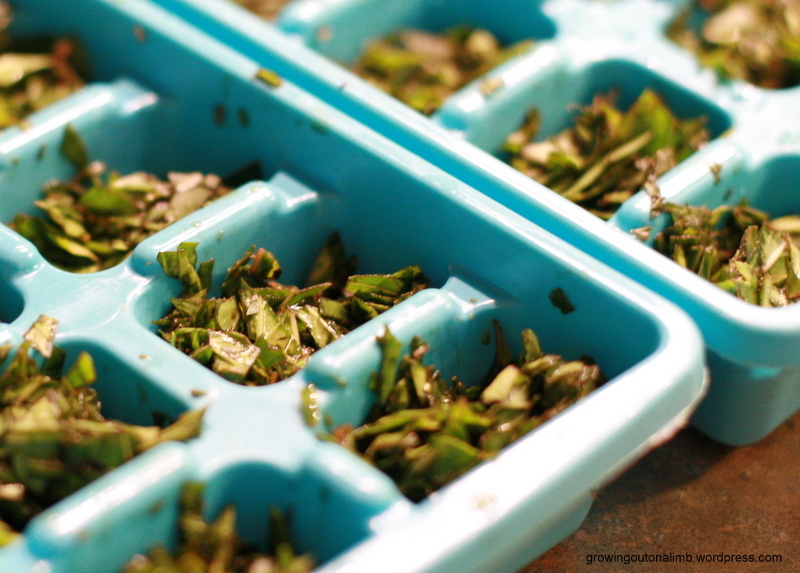 Add water and then freeze. 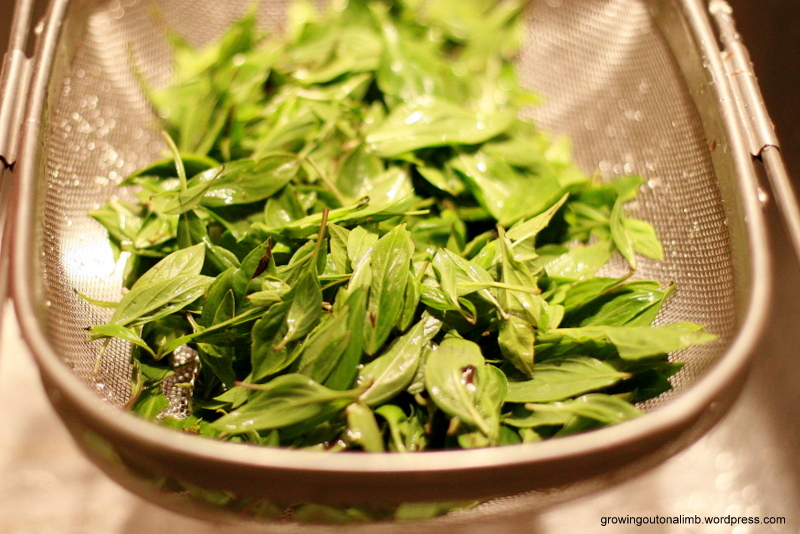 Then you pop them out and stick them in a baggy, ready to use in any recipe that calls for fresh basil. Just run the cube under warm water and throw it in! Categories: In the Kitchen, Recipes: Preserving | Permalink. 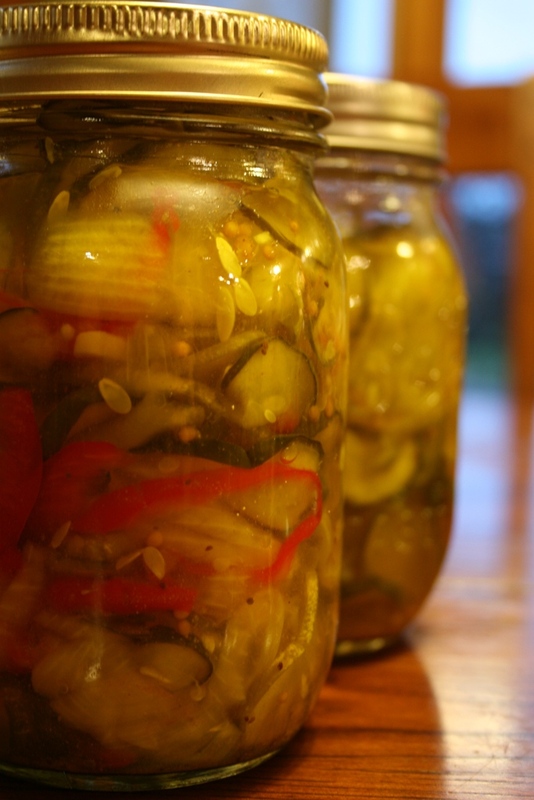 That’s what I called these pickles on my recipe card and I’m sticking with it! Hubby pretty much insisted that I get this recipe from our friend Jill after sampling a bottle of pickles that she dropped off. I love dill pickles anyway but these have a sweetness to them that make them extra special. And the best part of these is that you don’t have to work for hours at a time to make a huge batch of pickles. You mix up the brine, leave it in the fridge, and make up the bottles as the cucumbers come ready. It is just so much more feasible for a busy mom. Bring vinegar, sugar, and salt to a boil. Boil for one minute then leave to cool. Once cool, add turmeric and alum. Refrigerate overnight. Leave in fridge and use as cucumbers are ready. Pack fresh dill in the bottom of the jar. Pack cucumbers tightly. Add more fresh dill. Refrigerate at least three weeks. Categories: Recipes: Preserving, Recipes: Vegetables | Permalink. Brian and Oliver are on a road trip for a few days so I am seizing the opportunity to stock the pantry and freezer with seasonal goodies. Who can resist the baskets of peaches sitting around the supermarkets right now? For us it means jam. Freezer jam to be exact. A couple of years ago I tried this No Cook Freezer Jam gelling powder by Clubhouse and I haven’t made any other type of jam since. It uses less sugar than other recipes, is full of chunky fruit, and even tastes better than others (as far as we are concerned). And, from start to finish, I have jars of jam in about 30 minutes. Because I love having my own jam but I’m a mommy and can’t spend hours and hours to get it. What a great way to enjoy yummy peaches all winter long! 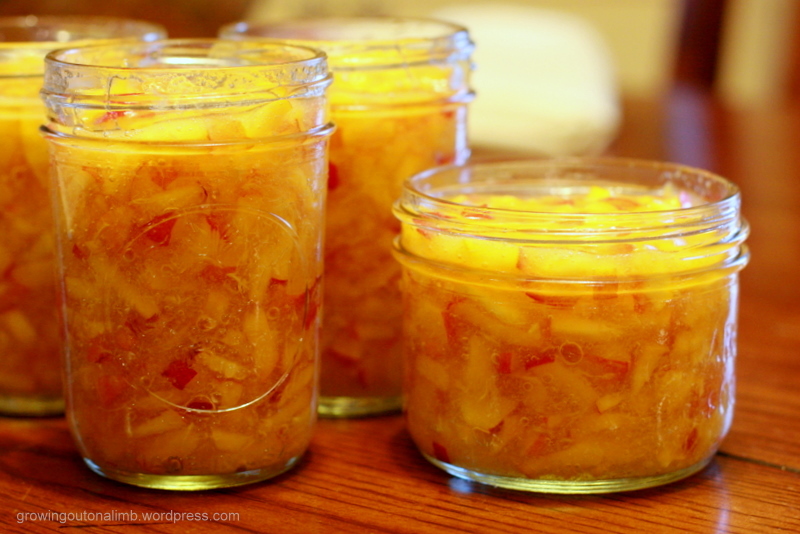 Categories: Recipes: Preserving | Permalink. I’m not sure applesauce is something Brian and I would have preserved just for the two of us, but, since Oliver was just starting to eat, we went on the hunt for a good recipe after our trip to the local orchard last fall. And, since we are looking ahead to two eating babies by springtime, we’re on the applesauce once again. Brian stumbled across this recipe and we were kind of intrigued by the “roasted” aspect of it. It is definitely sized to be more of a ‘make a batch with pork chops’ recipe but it multiplies well and it’s delicious… isn’t that deep color gorgeous?! Of course you can play with the sugar and spices to make it what you want but I find it good as is. I really like that you don’t need to grind and sieve it. It makes it just a tad on the chunky side (yum) but means you have to peel and core the apples. I don’t mind … peeling still seems a heck of a lot easier than the alternative. Mix all ingredients but the apples. Pour in the bottom of the pan you will be roasting in. You can toss the apples in the liquid as you chop to keep them from browning. Bake in a 400 degree oven until the apples are very soft. Make sure you stir it occasionally. Mash the apples. If you chop your apples small enough, you can actually do this with the spoon. Since it’s a lot of work to peel 100 lbs of apples and cook them all at once (and my evening time is limited), I have make just one batch at a time and store it in the refrigerator. A few nights later, I heat the batches all together in a big pot (because the jars need to be hot packed), jar them, and then pressure can them for 10 mins with a 5-lb weight. You can safely and easily can apples using the water bath method but I have a canner so, for me, pressure canning is easier. 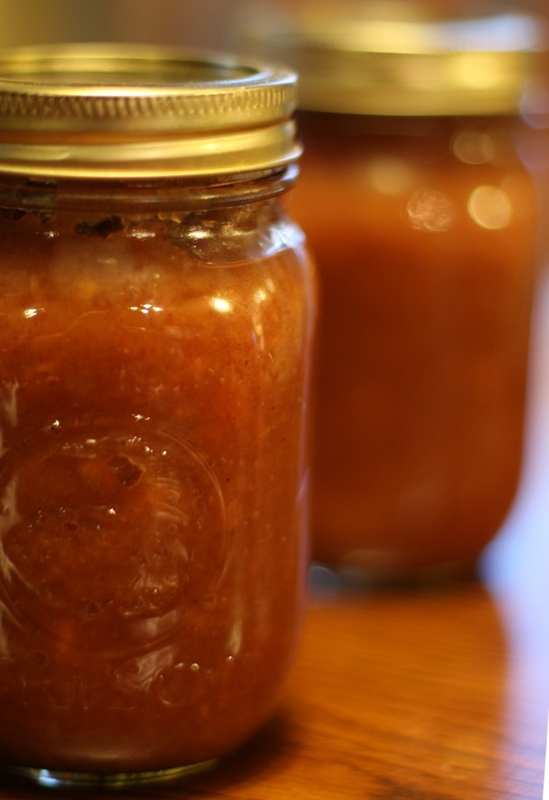 Categories: Fall, Recipes: Preserving | Permalink. We still have lots of dill pickles in the pantry so I am adding bread and butter pickles to the mix this year. I found this recipe at allrecipes.com. Ninety glowing reviews can’t be wrong, right? The only substitution I made was to use red bell peppers instead of the green. I can’t imagine it affecting the taste much and it makes it a bit prettier in the jar. I used my food processor’s slicer attachment to do the cukes, onions, and peppers. It hacked some of the cucumbers a little more than than you might want, but it’s worth the savings in time and effort. In a large bowl, mix together cucumbers, onions, bell peppers, garlic and salt. Allow to stand approximately 3 hours. (I have to note here that I do not own a bowl that big so I had to use a new, washed-well pail – many commenters had to find other solutions too). After soaking the cucumber mix, put the cider vinegar, white sugar, mustard seed, celery seed, whole cloves, and turmeric in a large pot (large enough to hold all of the cucumber mix). Bring to a boil. Meanwhile, drain the cucumbers. I took the advice of many commenters and also rinsed them. Stir the mixture in to the boiling vinegar mixture. Remove from heat just before the mixture returns to a boil. Transfer to sterile containers. Seal and chill in the refrigerator until serving. (I wanted to store these in my pantry, so I also processed them in a hot-water bath for 10 minutes). 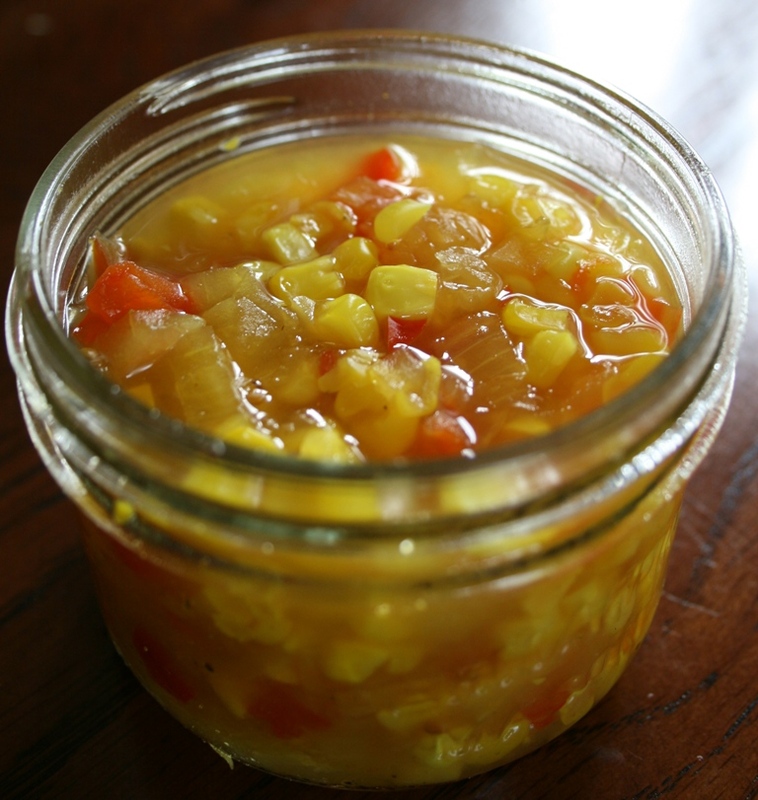 Categories: Recipes, Recipes: Preserving, Summer! | Permalink. 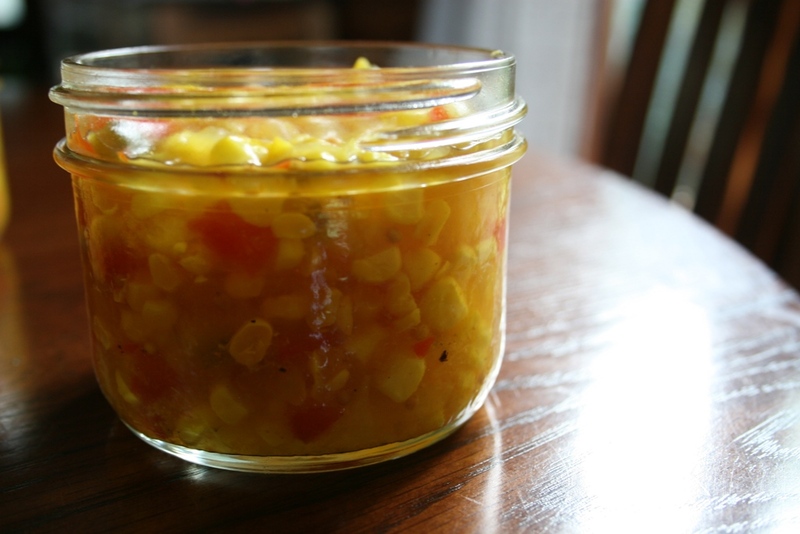 For my own notes, here is the recipe for the Corn Relish mentioned in the previous post. The original recipe is here at Simply Recipes… all props to her. 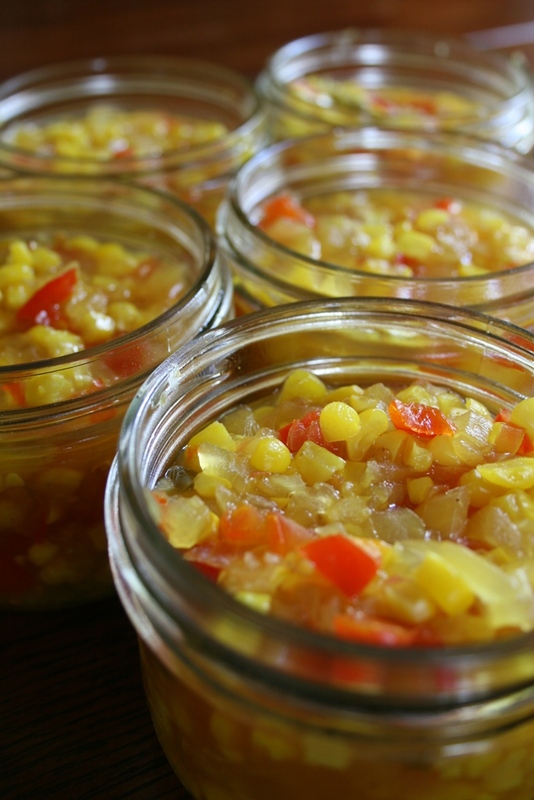 If you would like to store your pickles outside of the refrigerator, sterilize canning jars before canning, and process the relish-filled jars in a hot water bath for 15 minutes after canning. I’ll add details about pressure canning these later. Categories: Recipes, Recipes: Preserving | Permalink. Now that the extreme heat and humidity wave has passed us by, I have finally been able to turn the oven on again (And thank goodness… making meals without turning appliances on is kind of like making meals without an arm or a hand). I’m not complaining because I do like the heat (yes, even while pregnant) but there are only so many nights you want to eat sandwiches for supper. So today I took to it and the theme was … CORN. Before lunch – Brown Sugar Meatloaves, two of them. 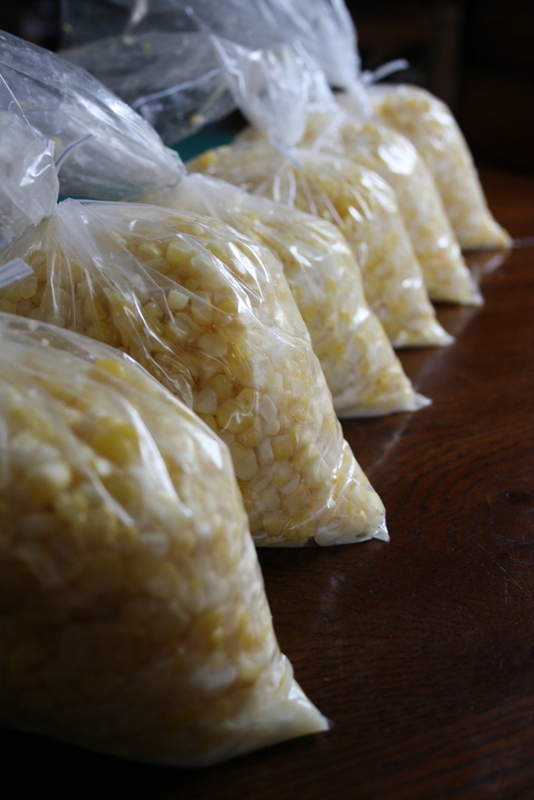 No, nothing corn-y about that but we had hamburg to use up and they’re so good for freezing in serving-size portions. I’ve used the same meatloaf recipe the last few times, and why not – Brian says it’s good, Oliver eats it up, and so far no one is complaining about being bored of it. After lunch I made a trip to the local market for some pickling/freezing supplies. 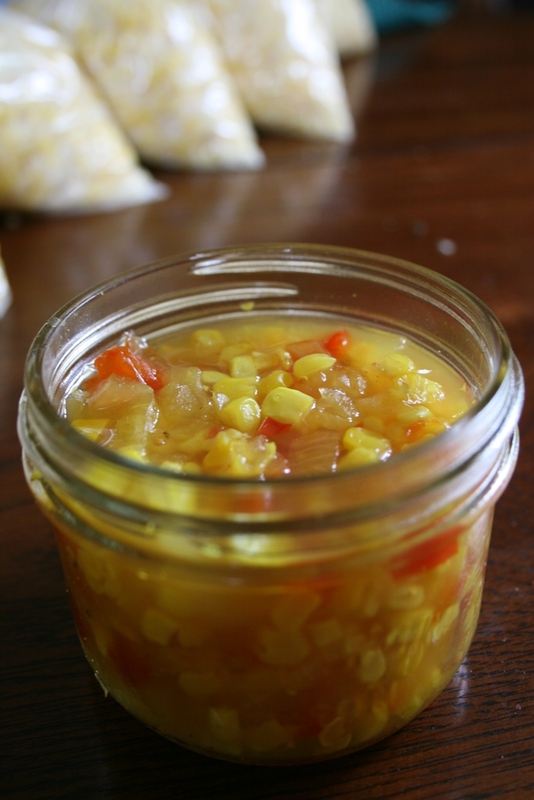 First up, corn relish. I saw this recipe posted at Simply Recipes just a few days ago and it sounded so good, I couldn’t resist. It was simple, quick, and tastes just like I expected it to (the only substitution was a jalapeno pepper for the serano chile). I plan on putting these through the pressure canner tomorrow so I can store them in the pantry. Also on the list today was simply storing some corn away for the winter. After purchasing 6 dozen cobs of sweet, sweet Hunter Brother’s corn, I steamed the cobs like usual and then took to cutting them off the cob. The owner of Hunter’s market herself shared with me the trick to make this easier: Prop the cob up in a bundt pan and, as you cut away the kernels, they fall into the pan! One of those why-didn’t-I-think-of-that tricks. 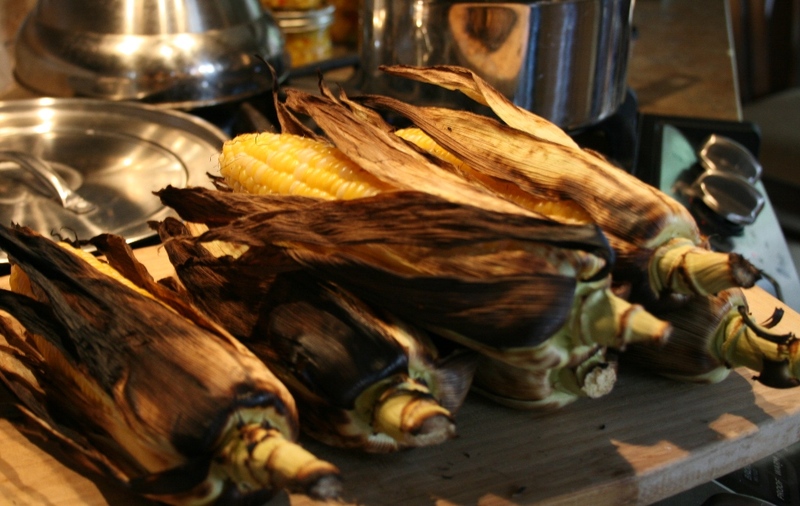 And, as if that wasn’t enough corn for one day, we finally tried grilling corn for supper. There are different ways to do this but here’s how we did it: Pull off the corn husks off but leave the last layer or two. Soak them in water for at least 20 minutes. Peel the remaining husks down carefully (but not off!) and remove the silk. At this point you can add butter, salt, and pepper but you can also wait and do that after it cooks, like we did tonight. And it was so yummy… I’m not sure if it is the corn caramelizing a bit as it grills or just the mix of the sweet corn taste and smokey grill taste but it is noticeably different than a steamed cob and very good. Next time I might try making an herb butter with fresh parsley and spreading a bit on before cooking. Also on the list was bread and butter pickles but I grossly underestimated how long those other recipes would take (with an 18-month-old underfoot) so they will wait until tomorrow. Categories: In the Kitchen, Recipes: Preserving, Summer! | Permalink.